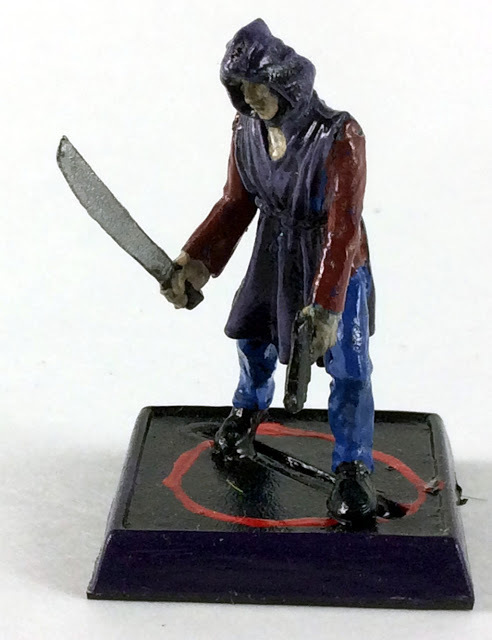 I love to collect miniatures of Cultists. I am not entirely sure why I am drawn to them, but I like them a lot. Perhaps it is because Cultists to me represent the minions of powers best left alone and that their exploration of evil makes them a perfect and clearly defined “bad guy” for any game. First up, let’s look at Jill Lucas by RAFM. She runs for $5.95 Canadian on their webstore and is a fantastic model! I painted this figure up years ago when I was not yet highlighting my figures. To paint her, I laid down my primer, painted her base colours and then shaded her with dark MinWax. She is still glossy because I did not spray her with Matte Varnish afterwards. A great looking figure by RAFM Miniatures. Reminds me a little bit of Buffy the Vampire Slayer. The pose is great, and I think she is a perfect figure to lead a Modern Day Cultist Gang. 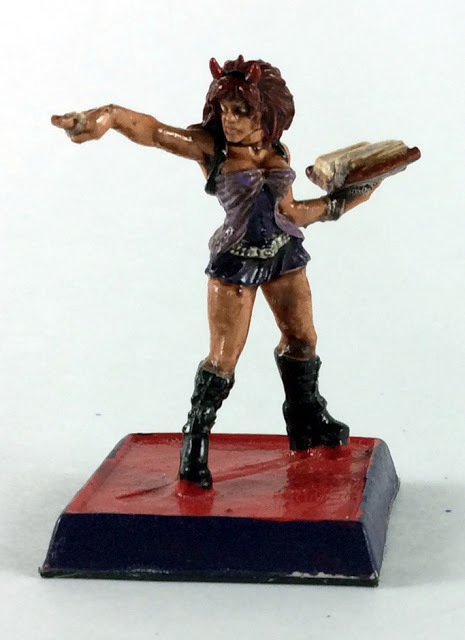 I also use her as a Spell Caster in Frostgrave (spell effect Beauty). For one of my earlier pieces, this figure painted up really well and it takes shading (with ink or “the dip”) nicely. 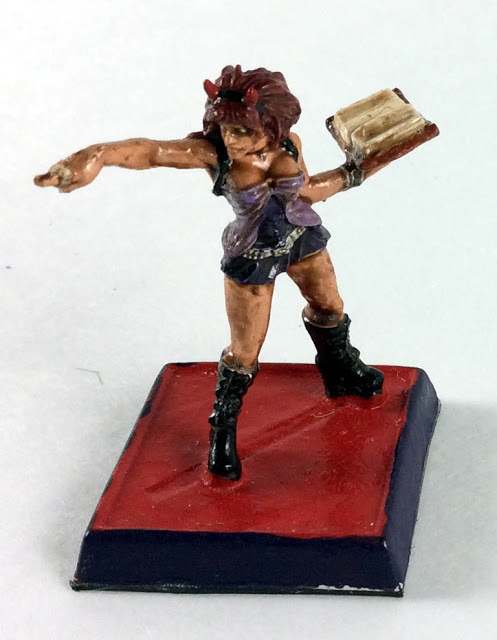 There is also a limited edition Jill Lucas available from RAFM with a spell effect of a spirit head coming out of the spell book. 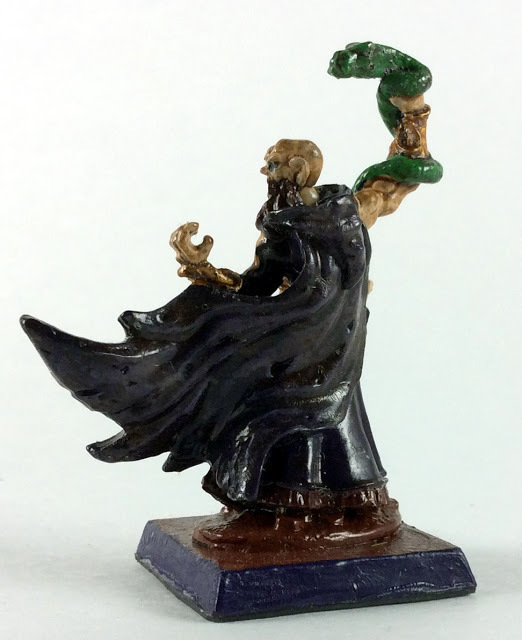 This is a really cool miniature and below is a picture from the RAFM website. They did a much better job than I did. Check out those eyes and the face details. Wow!!! This picture is from the RAFM Webstore. This Limited Edition Jill Lucas currently sells for $10.95. For my Gang of Cultists, I also bought RAFM’s Cultist Box Set. This box set comes with 10 miniatures for $34.95 Canadian. The figures can also be purchased in a 4-pack blister for $12.95. These Cultists are metal and come as multi-piece models that require assembly. Personally, I prefer my metal models as single pieces, but they held together well with Crazy Glue. There are extra pieces in the box, so there is some variety in how the figures can be made. A picture of the box cover from the RAFM webstore. It is not a bad box at all. 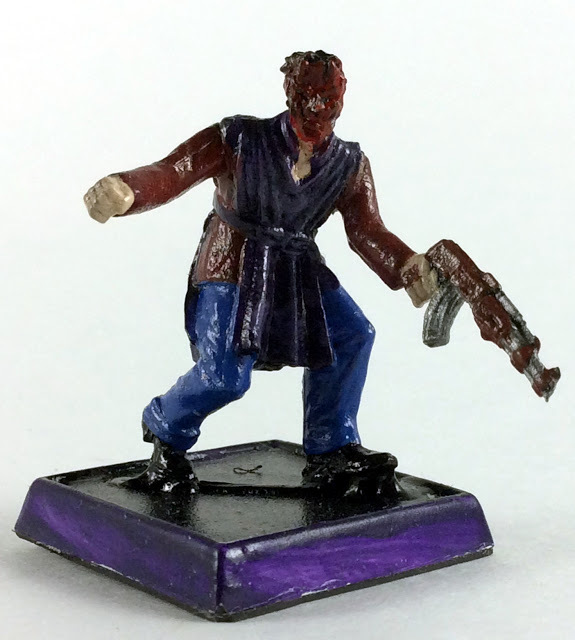 For anyone that is in the market for shambling Modern Day Cultists, they fit the bill well. 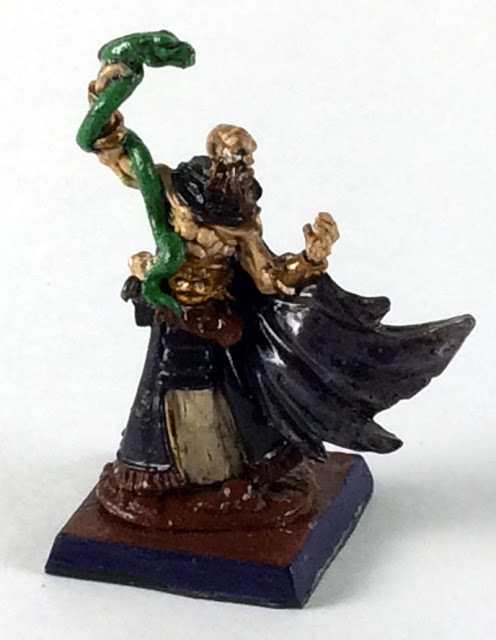 Below are pictures of how I painted up my Cultists. These models represent when I started experimenting with highlighting. The robes were painted a dark purple followed by a lighter purple to highlight the raised edges of the fabric. After highlighting, I brushed on Dark MinWax to do the shading. That is how I finished the models. They are still glossy because I did not follow up the MinWax with a Matte Varnish. 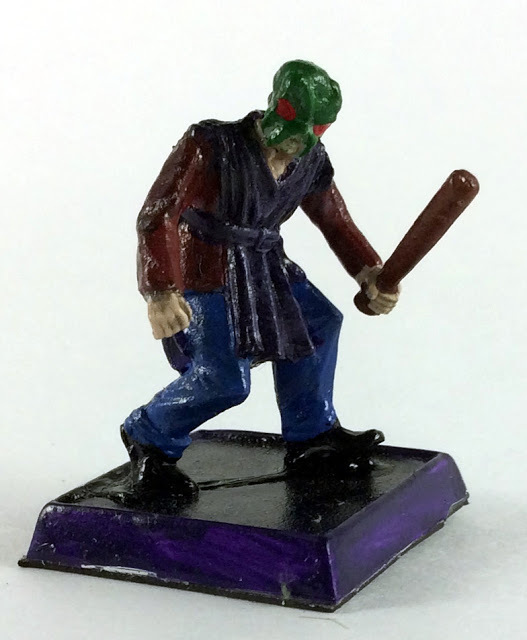 This Cultist wears a mask and carries a bat. Love the robes and hood. I am not a big fan of the AK47, but used them anyhow. Another mask. These minis have a shambling look to them so I feel that the automatic weapon looks a little awkward in their poses. I am sure that others will have a different opinion than mine and that is fine. This is one of my favourite models that I made from the group. 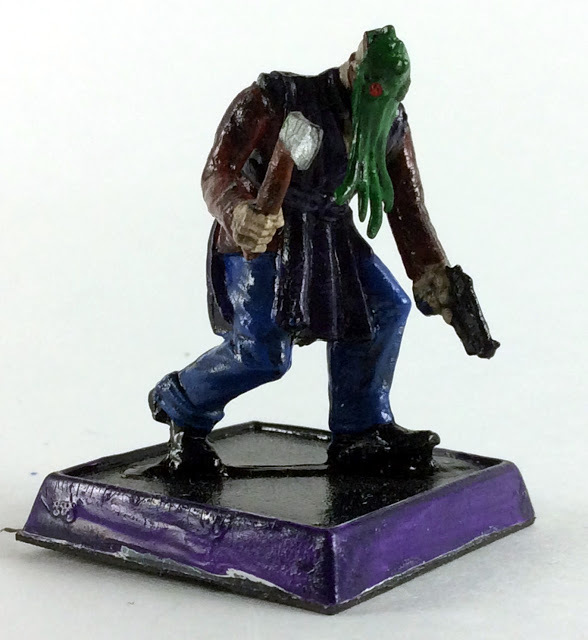 The hand pistols look awesome on these models and that mask is perfect for any modern Cthulhu related game. The back of the model. Here one can see that the figure is wearing a mask and doesn’t actually have a tentacle covered face. 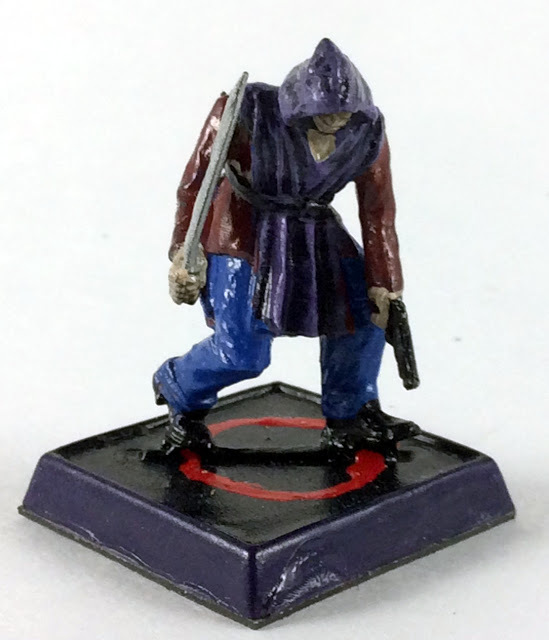 Again, the figures that I made with the hooded heads all look awesome! Another figure hunched over a little more than the one above. The pistol is one of my favourite weapons for these Cultists. 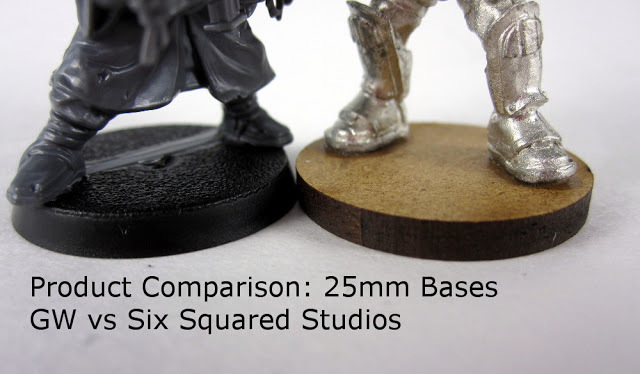 So how do these minis size up versus other companies? Left to Right… RAFM Cultist, Reaper Miniatures Cultist Leader, RAFM Cultist, Frostgrave Cultist, RAFM Jill Lucas, Reaper Bones Cultist, RAFM Cultist, Frostgrave Necromancer Apprentice. When comparing my Frostgrave Apprentice to the Cultist beside him, I can tell that my painting skills have come a long way over the years. The difference in painting quality is not a reflection of the sculpts. 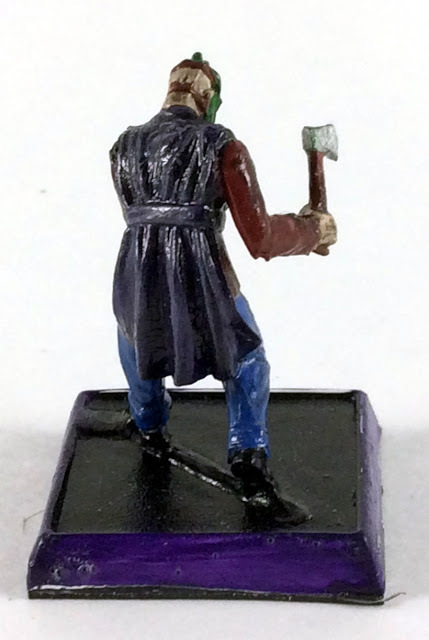 The RAFM Cultists are the same height as the Frostgrave minis because they are hunched over. Jill Lucas is standing at full height and just slightly taller than the Frostgrave figures. The Reaper figures are a fair bit bigger, but I use all the lines together. I figure people come in different shapes and sizes so why not do the same with my minis? They don’t all need to be uniform in height. Below is a picture of my entire Modern Day Cultist Collection. This is my full collection of Cultists for use in Modern day settings. There are three models here not in this review yet. To the far right is Taenar a Cultist Leader by Reaper Miniatures. He is currently $5.49 American and available from the Reaper Website. In the back row, I have two Mantic Games Ghouls. They are dressed up in Cultist rags and had the odd nubs on the models cut off. The Mantic Figures came free to me in the mail when Mantic did their figure give away years ago. A higher level shot to give a better view of the back row. 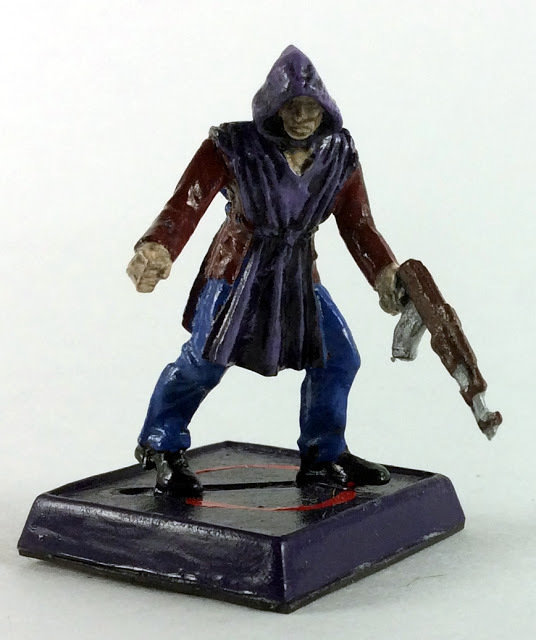 Since I am showcasing all of my Modern Day Cultist Figures, I might as well show off some more pictures of Taenar the Cultist Leader by Reaper Miniatures. The details in this model really showed up well. When I painted this model, I was not yet highlighting my models. He is painted by just doing base coats followed by a MinWax shading. A picture of the Leader’s back. There is lots of detail in that cape. Although he is from a Fantasy line, I see no reason not to use him in a Modern Game. In today’s dollars, that model runs roughly $7.25 Canadian. Our Dollar was doing better when I bought him, so I got him at a better price. It is still a good model and far from GW prices (even at $7.25). He is pretty cool. I hope that my readers enjoyed this review and showcase. For those interested in more about either Cultists or Modern Day Heroes, bellow are some links to other related posts that I wrote in the past. 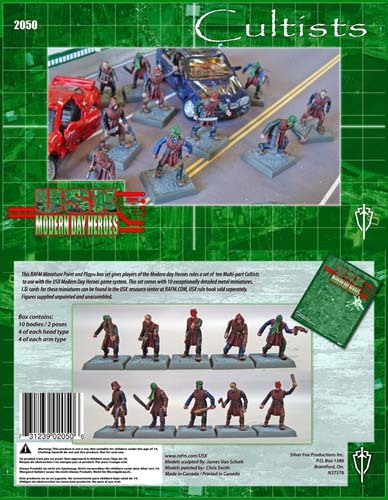 For more about Cultists, check out this Review and Showcase of what is in the Frostgrave Cultist Boxed Set. For more about Modern Day Heroes, check out The Week of the Law where I did a series of four related articles. As always, please feel free to share this page and head on over to my Facebook Page and give it a Like.